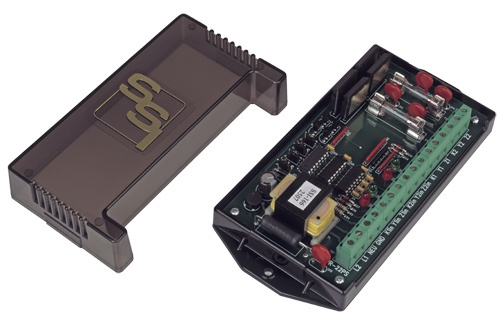 The RPR-22PS dual pulse isolation relay incorporates two independent signal channel isolation relays in one compact package. It provides two isolated solid-state Form C (K, Y, & Z) contacts from two Form A or C inputs. Each input of the RPR-22PS supplies its own sense voltage to the pulse sending unit(s), usually an electric meter’s pulse initiator. Typical applications include interfaces between utility metering devices and customer-owned energy control systems, demand recorder applications, or supervisory control systems (SCADA) interfaces. The RPR-22PS is particularly useful in applications where one channel is Kwh pulses and the second channel is Kvarh pulses. The RPR-22PS relay is designed to filter noise and transients from its input to prevent any false pulses at its output. Bright red and green LED lamps indicate the system’s status at all times thus allowing a rapid visual check of the system’s performance without requiring any additional test equipment. In addition to selecting the Input type, the output timing configuration may be selected between long or short modes. In the long mode, the output directly follows the input creating a “mirror image” of the input pulse. In the short mode, the output will close for a fixed 100mS “short” pulse. The short output mode is generally used with a Form A end-of-interval or timing pulse. 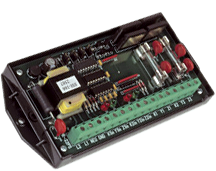 The RPR-22PS’ input and output circuit’s terminal strip connector is a “EURO” type, providing excellent insulation from live electrical contacts. Each K lead of the RPR-22PS’ outputs is fused to prevent damage to the relay under almost any conditions a user might cause such as excessive current, incorrect wiring, etc. The RPR-22PS’ robust solid-state switching device is rated at 800V at 750mA giving maximum protection from lightning or transient voltage damage. Its built-in transient protection for the solid-state switch contacts eliminates the need for external or off-board transient suppression devices. All component parts that have power applied to them, with the exception of the input/output terminal strip are enclosed in a polycarbonate cover for maximum protection. The mounting base plate is also made of polycarbonate and offers excellent electrical insulation between the circuit and the mounting surface.